Can you Spare a Few Trillion? Most governments in advanced economies have been unable to deliver on debt sustainability for the last decades. In some cases increasing spending is not matched by their ability to find additional sources of revenues, in other cases taxes have been reduced without the corresponding reduction in spending. And it will only get worse going forward as worsening demographics will put enormous pressure through the corresponding increase in spending. As we can see in the US presidential race, solutions are not easy to find. Everyone talks about finding a sustainable path for the government debt but details on how this will be achieved are difficult to find. This is probably more obvious in the case of Mitt Romney and his promise to cut taxes. This is only compatible with debt sustainability if you find enough spending items in the budget to cut, but that is where the difficulty lies. Societies ask governments to provide certain services that are considered to be necessary. Yes, we can make governments more efficient and eliminate some unnecessary bureaucrats but when you look at the numbers, this is not going to be enough - in some cases there is very little margin to reduce spending if you just follow that route. Here is a picture from the US that makes this point as clear as possible. 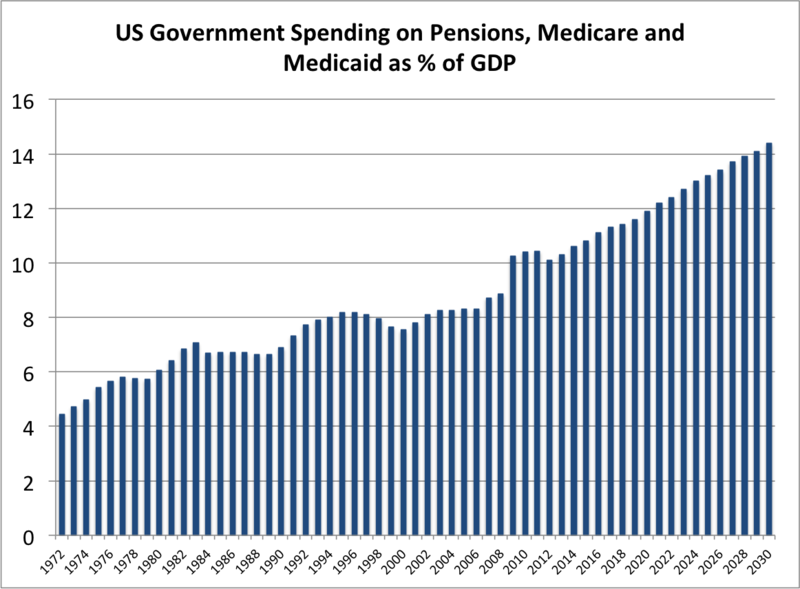 Government spending on pensions and healthcare (medicare and medicaid) from 1972 until today and then extrapolated to 2030 (source: Congressional Budget Office). What is striking about this picture is not so much the shape but the magnitude of the increase. From 4% of GDP in 1972 to about 10% today and reaching 14% in 2030. 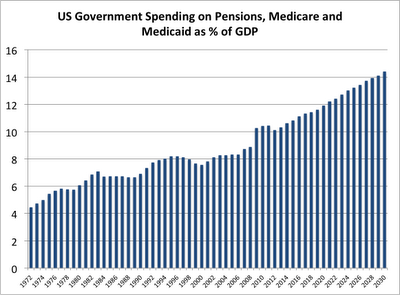 This is measure as % of GDP (not % of government spending). In the absence of a reduction in spending in some other budget items, this has to be met by increasing revenues (taxes) by a similar amount. This looks like an impossible task. But let's try to look at it from a different angle to see if we find a solution. Forget about governments, imagine a world where all goods are purchased by the private sector (e.g. you pay for your own healthcare). 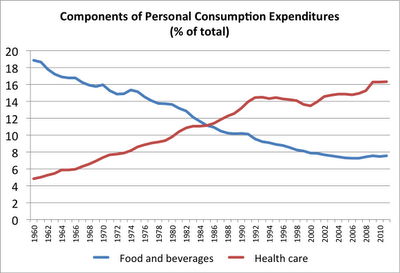 Because of changes in taste, income and technology, we continue spending more on certain sectors (such as healthcare). We have satisfied all our basic needs (food, housing), our income keeps increasing and there is a technology out there that allows us to live healthier and longer so we choose spending more on it. Sectoral changes in the composition of our spending are not rare. How visible is the above trend if we look at consumer expenditures? Do we also see a large increase in healthcare spending in the private sector? And, more interestingly, are there other components that are going down at a similar speed to ensure that budgets are not overstretched? Here is a quick look at Personal Consumption Expenditure by type of good (Source: Bureau of Economic Analysis). I picked the sectors that have moved the fastest and I particularly looked for two moving in opposite directions. 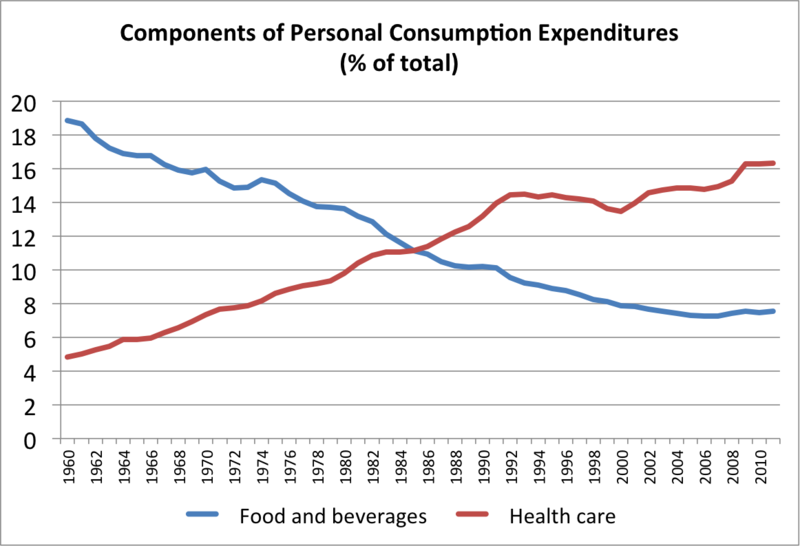 This is what you find: Healthcare is the fastest growing component and has gone from 4% in 1960 to 16% today (this is measured as % of the total expenditures). The component that follows the opposite trend and almost by the same magnitude is Food and Beverages. From 18% down to 8%. So we spend less in food and beverages to be able to afford the increasing cost of going to the doctor more often and enjoying a healthier and longer life. 1. Either they find some spending in their budget that we do not want anymore and they reduce as fast as healthcare and pensions public spending is increasing. 2. Or they do simply pass the bill to the private sector (you will need to pay for those doctors). But if they do so, then the private sector will need to find something else to cut. What we have seen is that #1 is not obvious. There are not that many things that governments do that we do not want them to do. And #2 is exactly what politicians do not want to do (and we do not want them to do it), to pass the bill to us in the form of higher taxes - and I am ignoring here the question of who exactly gets the bill. So we end up with debt levels that keep increasing and will do so until we find a way to deal with long-term sustainability of government finances that is very different from what we have done in the past. The US Federal Reserve just announced the third round of quantitative easing (QE3) by signaling a commitment to keep rates low for a long(er) period of time and engage in additional purchases of assets at a rate of $40 Billion a month. Reading the press commentary on this move I can see once again the difficulty in making strong and clear economic policy decisions to end the crisis. I do not want to discuss in this post the potential effects of QE3 but simply the way it is being interpreted in the context of the mandate of the US Federal Reserve. "The Federal Reserve did not need to do this. Its dual mandate, to ensure full employment and combat inflation pointed in different directions. Political pressure against taking action (...) was intense". "That is why, by default, the Fed felt it had to do this." Notice the different choice of words for the two sentences. The article opens up with the statement that the Fed did not need to do this and then it tells a story of why the Fed felt it had to do it (even if they did not need to do it?). The dual mandate of the US Federal Reserve is as explicit as it can be even if the precise definitions of full employment and price stability can be open to interpretation. Imagine that inflation had been higher than the implicit or explicit Fed target for several years with an economy at full employment. Would we be saying that the Fed does not need to raise interest rates? No. We would be screaming for the Fed to raise interest rates as aggressively as possible. The US economy has now been producing at a level which is clearly below its potential for the last four years. The unemployment rate is at levels that are higher than any sensible estimate of the natural unemployment rate. To make matters worse, inflation and inflation expectations have been consistently below the Fed target. How do we go from here to the conclusion that "they did not need to do this"? I can imagine a discussion on the effectiveness of additional quantitative easing measures. Will they have an effect on output and employment? I can see a debate on this question but not on one about the need to find additional ways to effectively stimulate the economy. Mario Draghi presented yesterday one more plan with great promises but short of details (as usual) to save the Euro. Markets are happy, but will this plan follow the fate of the previous announcements? Will the excitement die out in a matter of weeks or days? The ECB is now finally sending a strong message that they will do whatever it takes to defend the Euro. In many ways this is a game changer and it is difficult to understand why this was not done earlier. When we think about monetary or fiscal policy as stabilizing tools we see them as forces that can make recessions shorter and recoveries stronger. Clearly what we have seen in the last years is a slow moving process towards the inevitable solution, the only way this crisis could be resolved. Did it really take that long for the ECB and European authorities to realize that this was necessary? Or was this a strategic move to push countries to do reform? My guess is that there is some truth in both. Even today some still believe that ECB intervention is a bad idea. And it is also quite possible that from the beginning some understood that this move had to happen but they wanted to wait until things got worse to extract concessions from the other countries before saying yes. Will the positive effect of this announcement vanish with time as it has happened with some of the previous ones? I doubt it, there will still be swings in the market mood but this time it can be different. The nature of unlimited intervention by the ECB to support the Euro is very different than any of the previous vague statements about creation of bailout funds without real support and no details on when and how the money would be disbursed. Here we have a statement from the central bank saying that they will do whatever it takes to keep the Euro alive and that they are willing to fight market distortions on bond yields (this is always a very risky statement to make for a central bank). The same way the Swiss Central Bank has been successful in its recent effort to stabilize the Swiss Franc or the same way the German and French central banks managed to defend the French Franc / German Mark exchange rate during the crisis of 1992/93, central banks can be very powerful when they want. Of course, the statement of Mario Draghi was very carefully drafted with strong references to price stability and sterilizations of interventions. If this signals a strong level of disagreement within the ECB, one that could potentially lead to an institutional crisis if the plan needs to be implemented at a large scale, then there is a risk that the announcement will not be effective. But it is hard to imagine this scenario. If the announcement has been made it must be that there is enough political support within the ECB (and the Euro area governments) to make this a reality, if necessary. And the beauty of credible statements of unlimited support is that they might work even if the ECB never has to intervene in bond markets.